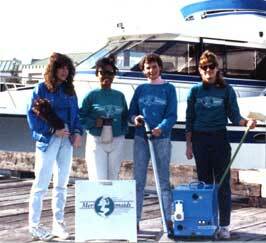 Mer-maid Products, Inc. (Mer-maids) was established in 1984 as Mer-maids Yacht Detailing & Maintenance. Growing quickly, Mer-maids became Seattle’s largest yacht detailing company. Keeping three or four crews of detailers productive had the company’s founder trying every available product on the market looking for those products that helped make the washing, waxing and detailing of boats more manageable and productive. Today Mer-maids continues to research and sell products of the highest quality. Our market is the Pacific Northwest where we enjoy great customer support and loyalty. If you have never heard of our products we are not surprised as we are still a small company without a large national advertising budget. Then again, we have received product inquires from all around the country. People have told us they acquired one of our products at the Seattle boat show or while on a trip through the Pacific Northwest or from a friend. Others have called us based on reading one of our how-to articles that appear in GO Boating or Sea magazine. No matter how you found us, we hope you find our site informative and that you feel confident in your purchase.